Galway Metals Consolidates Highly Prospective Clarence Stream Gold District in New Brunswick, Canada - Galway Metals Inc.
(Toronto, Ontario, August 3, 2016) – Galway Metals Inc. (TSX-V: GWM) (the “Company” or “Galway”) is pleased to announce that it has entered into an Option Agreement to acquire a 100% undivided interest in Wolfden Resources Corporation’s Clarence Stream property located 70 kilometres (km) south-southwest of Fredericton in south-western New Brunswick, Canada. In conjunction with this acquisition, Galway has also acquired Jubilee Gold Exploration Ltd.’s Birneys Lake property, which is adjacent on the south side of Wolfden’s Clarence Stream property, and the Company has staked a significant number of additional claims both to the east and west of Clarence Stream. The consolidated land position comprises 45 km of strike length of the Sawyer Brook Fault System and straddles several intrusives, which are believed to have created the conditions necessary for gold deposition at Clarence Stream (Figure 1 and for more information please review Galway’s presentation). 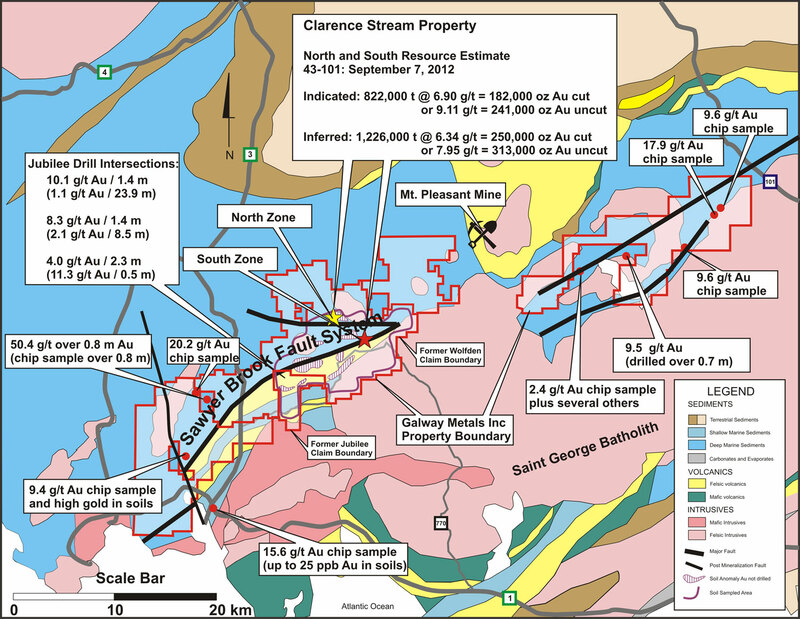 Clarence Stream hosts Indicated Resources of 182,000 ounces of gold at 6.9 g/t (9.1 g/t uncut), plus Inferred Resources of 250,000 oz at 6.3 g/t (8.0 g/t uncut). The property also hosts antimony, with Indicated Resources totaling 7.3 mm lb at 2.9% Sb. The existing resource represents two km out of 45 km of strike length, leaving approximately 90% of the Sawyer Brook Fault System to be explored. Average depth of the 428 holes drilled for resource estimation was shallow at 127 metres, leaving significant potential for expansion at depth. All zones are open in at least one direction; many are open in multiple directions. Many resource-grade drill intersects in multiple zones are located outside the resource. Gold-bearing boulders that assayed up to 16.5 g/t Au, 11.5 g/t Au and 7.9 g/t Au are closely associated with a 700 m by 200 m soil anomaly that has never been drilled. Galway’s newly staked claims host many high-grade chip samples, including 20.2 g/t Au and 9.4 g/t Au to the west and 17.9 g/t Au and two samples of 9.6 g/t Au to the east. Numerous large strong geochemical and geophysical targets have not been drilled. Potential for increasing shallow and deeper resources from multiple zones. The steep dip of the main South (Proximal) Zone is conducive to cheaper longhole mining methods. Wide high-grade gold intersects occur, including 14.3 g/t over 21.6 m, 22.7 g/t over 9.0 m, and 12.6 g/t over 14.5 m (see below for TW, includings and cut grades). Continuity along strike is good, with individual shoots ranging up to 400 metres. Metallurgical tests have estimated gold and antimony recoveries in excess of 90% using gravity, flotation and conventional CIL milling. Galway’s consolidation of land around Clarence Stream has made the Company by far the largest mineral rights owner in the area with 43,800 hectares, or 108,000 acres, including a strategic 45 km along the major, regional Sawyer Brook Fault System. Infrastructure is excellent with two airports within 110 km, rail in close proximity, a highway and power line bisecting the property, three nearby towns to source employees, services and supplies and a major seaport in Saint John. New Brunswick is an excellent place to operate, having ranked first worldwide for Mining Policy Perception by the Fraser Institute in 2011/12, and has ranked in the top-10 each year since. Galway is paying CDN$3.5 million over three years, with first year payments totaling CDN$1.0 million, plus NSR’s on portions of the property, most of which provide buyback rights. The acquisition price is US$6.23/oz of gold, or US$6.00/oz after antimony credits. A National Instrument (NI) 43-101 resource report published on September 7, 2012 for Wolfden by Roscoe Postle Associates (RPA) estimated that Clarence Stream hosts Indicated Resources of 182,000 ounces (oz) of gold at 6.9 grams per tonne (g/t), plus Inferred Resources of 250,000 oz at 6.3 g/t (Table 1). Clarence Stream is also host to high-grade antimony (Sb) resources, with Indicated Resources totalling 7.3 million pounds (mm lb) at 2.9% Sb. To the best of Galway Metals’ knowledge, information and belief, there is no new material scientific or technical information that would make the disclosure of the mineral resources in the Technical Report inaccurate or misleading. Since the report was written, only 18 holes were drilled by Wolfden, of which only seven could potentially have a minor impact on the resource. As such, Galway Metals considers the Technical Report to be current, pending further investigation/work by Galway Metals. Michael Sutton, P. Geo., Director of Galway Metals and a Qualified Person for the purposes of NI 43-101, has reviewed the Report on behalf of Galway Metals and has approved the scientific and technical content of this news release. A NI 43-101 report will be completed within 180 days to support the resource estimate. Mineral Resources were estimated using an average gold price of $1,000 per ounce (oz) and assumed operating costs. Mineral Resources are based on a cutoff grade of 3.0 grams per tonne (g/t) gold (Au). Wireframes at 3.0 g/t Au and a minimum thickness of two metres were used to constrain the grade interpolation. High gold grades were cut to 30 g/t Au prior to compositing. Uncut grades are listed for comparative purposes. Several blocks less than 3.0 g/t Au were included to expand the lenses to the two metre minimum thickness. Most of the 428 drill holes used for the gold and antimony global resource estimate were shallow, averaging 127 metres. This suggests that there is excellent potential to expand the resource to depth, especially in the South Zone where structures are steeply dipping and where the majority of resources have been identified to date. As most of the resource is within 150 metres of surface, there is excellent potential for both high-grade shallow and deeper opportunities in multiple zones. The size of Galway’s Clarence Stream property is quite large at 43,800 hectares, or 108,000 acres. This makes Galway by far the largest owner of mineral rights in the Clarence Stream region. The property hosts 45 km of the Sawyer Brook structural corridor and associated granodiorite intrusive, of which only about four km have been drilled, and only two of those km are host to the majority of reported gold resources. Of the two kilometres drilled outside the resource but along strike of the Sawyer Brook Fault System, one was on Jubilee’s ground located five km to the west, while the other was immediately west of the resource. Drilling in both areas outside the resource returned resource-grade intersections such as 10.1 g/t Au over 1.4 meters (within a broader interval containing 1.1 g/t Au over 23.9 meters) and 8.3 g/t Au over 1.4 meters (within 2.1 g/t Au over 8.5 meters) on Jubilee’s ground, and 10.4 g/t Au over 1.0 meter and 3.0 g/t Au over 3.0 metres immediately west of the South Zone resource. True widths for Jubilee’s drill program and for Wolfden’s drill intersects west of the South Zone resource are unknown at this time. The Jubilee intersections span a 200 metre strike length along the fault and are open in every direction. As Table 1 above shows, the Clarence Stream resource is subdivided into the steeply dipping South (Proximal) Zone and the mostly flat-lying (potentially open pitable) North (Distal) Zone (also known as Anomaly-A). The Sawyer Brook structural corridor hosts the South Zone resource where 78% of gold resources have been identified to date along just two km. With 45 km of strike length now consolidated along a major ore-bearing structure (similar to the Cadillac-Larder Lake Break) and with geochemical and geophysical anomalies identified along this trend, Galway plans on exploring these high priority targets. In addition, the Clarence Stream property is host to an approximate 10 km by four km geochemical anomaly, the vast majority of which has not been drill tested. Geochemical and geophysical anomalies have coincided well with gold discoveries to date. Wolfden completed its 4,000-metre, 18 hole drill program at Clarence Stream in 2013, after RPA’s resource estimate was published. As such, none of Wolfden’s results were included in the resource estimate. Nonetheless, Wolfden’s drill program, which occurred primarily in the eastern part of the South Zone, returned some encouraging intersects, such as 8.8 g/t Au over 2.5 metres at 280 metres below surface, 8.8 g/t Au over 1.3 metres, and 14.0 g/t Au over 1.0 metres. While Jubilee conducted 3,435.5 metres of drilling in 20 holes at Birneys Lake, it did not issue a resource estimate. Significant intersects from Jubilee’s drilling are noted above. Freewest Canada Resources Inc., which was owner and operator of the Clarence Stream property until Wolfden purchased it in 2012, undertook the drilling used for resource estimation from January 2001 until August 2008. This program totalled approximately 54,000 metres in 428 drill holes. The South Zone resource dips steeply between 60o and 75o northwest, and the average length of holes drilled into this zone by Freewest was 164 metres-249 holes totalling 40,759 metres (drill hole lengths in the North Zone averaged 80 metres). Of significance is that a major component of Freewest’s last drill campaign from June 2007 through August 2008 successfully extended the resource to depth below the Central Lens (part of the South Zone), thereby delineating the Deep Lens. This Deep Lens is now the largest part of the overall resource, comprising 102,000 oz, or 31% of the South Zone total. This highlights the potential to extend gold resources to depth. Galway plans on drilling extensions of the South Zone to depth and along strike to expand the resource. Deeper intersections include 8.3 g/t Au over 11.3 metres (9.3 m TW) (incl. 84.9/0.5 m, 50.2/0.5 m; 5.1 g/t cut), and those that are open to depth include 3.9 g/t Au over 4.0 metres (3.4 m TW), 8.1 g/t Au over 1.0 metre (0.7 m TW), and 6.9 g/t Au over 2.5 metres (2.1 m TW). Mineralized veins in the North Zone are dominated by the AD-MW Lens, a bowl-shaped, potentially open pitable structure that is relatively flat dipping with an average thickness of approximately three metres. The AD-MW Lens ranges from surface outcrops to 100 metres below surface. The overall resource estimated for the North Zone is comprised of five lenses within a one km by two km area. Intersections such as 58.0 g/t Au over 1.0 metre (30.0 g/t cut), 5.9 g/t Au over 8.0 metres, 1.1 g/t Au over 19.0 metres and 11.9 g/t Au over 2.0 metres are open. These and the many geochemical anomalies in the area of the North Zone are targets that Galway plans to drill. The zones are open to expansion with intersections such as 2.3 g/t Au over 3.0 metres and 3.7 g/t Au over 2.0 metres located 240 metres and 230 metres from the next closest drill holes; other intersections such as 4.4 g/t Au over 3.2 metres and 9.5 g/t Au over 1.0 metre are open as well. Galway is planning a seismic survey to delineate fold hinge axis points where gold deposition should be thickest in order to best target the potential of the zone. The high-grade antimony resource is located in the North Zone. While antimony comprises only about 4% of Clarence Stream’s total resource value, it accounts for 15% of the metal value of the North Zone. These percentages are based on gold and antimony prices of $1,300/oz and $3.00/lb, respectively. Initial metallurgical test results for gold and antimony estimated recoveries using gravity, flotation and conventional carbon-in-leach (CIL) milling at more than 90% for both the South and North Zones. As with the need for more exploration to gain insight into the ultimate size of the Clarence Stream resource, Galway believes more metallurgical testing is also required. Galway’s property is adjacent to the Mount Pleasant tin-tungsten-molybdenum mine and mill, which closed in 1985. Although most of the equipment has been sold, mill infrastructure remains intact, and the property has a fully permitted tailings facility, power line and buildings. Strategically, Galway has reached an agreement to lease space within the mill buildings, as well as outside, for core, chip sample, pulp and reject storage, and for core splitting and logging purposes, among other requirements. Cash payments for all of the properties Galway is acquiring will be CDN$3.5 million over three years plus 1% Net Smelter Return (NSR) royalties on portions of the project, with Galway retaining rights to acquire most of the NSR’s. Galway’s cash payments in the first year will be CDN$1.0 million, and there will not be any shares issued for any of the deals. As such, Galway will continue to have 57.2 million shares outstanding, there will not be any shareholder dilution and the Company retains approximately US$8.3 million, or CDN$10.8 million (CDN$1.31/US$1.00 exchange rate as at August 1, 2016) of available cash versus US$9.2 million, or CDN$12.0 million prior to the transactions. Galway has no long-term debt. The total purchase price of CDN$3.5 million, prior to accounting for the NSR royalties, is US$6.23/oz, or US$6.00/oz after antimony credits. Jubilee: Galway acquired the Birneys Lake project at Clarence Stream for CDN$200,000 plus a 1% NSR royalty with a buyback option for half (0.5%) at any time for CDN$500,000. Staking: Galway staked 1,170 claims, or in excess of 26,500 hectares (65,500 acres) of land to the east and west along the prospective Sawyer Brook Fault System and associated intrusives for CDN$70,200. This added approximately 30 km of prospective ground for future exploration (included in the 45 km total). 1% NSR royalty with a full buyback option at any time for CDN$2.0 mm. Franco-Nevada Corporation has a 1% NSR royalty on a portion of the Clarence Stream property, on which there is no buyback option. In addition, a portion of the Clarence Stream property is subjected to a 2% NSR royalty, of which half (1%) is subject to a buyback option at any time in two 0.5% increments for CDN$500,000 each. New Brunswick is well known as a mining-friendly jurisdiction, having ranked first worldwide for Mining Policy Perception by the Fraser Institute in 2011/12, and has ranked in the top-10 each year since. The Clarence Stream property is accessible via airports at Fredericton and Saint John, via Provincial Highway 770 that bisects the property and via rail. Also bisecting the property is a major power line, which services Clarence Stream and the neighbouring Mount Pleasant Mine and Mill as well. Employees, services and supplies will be sourced from nearby towns of St. Stephen, St. Andrews and St. George and a major seaport is located at Saint John 110 km to the east. The South Zone lies within a steeply dipping, east-northeast trending high-strain zone. RPA outlined 38 individual lenses over a strike length of two km, to a maximum depth of 350 metres. Gold mineralization is commonly hosted in quartz veins, quartz stockwork, and along the contacts and within sheared and altered metagabbro and microgranite sills and dikes that crosscut the meta-sedimentary rocks of the Waweig Formation. There is a strong spatial relationship between veining and the microgranitic dikes and sills that, in detail, crosscut and post-date the gabbro. Evidence suggesting that the South Zone is related to the St. George (Magaguadavic) Batholith includes the close spatial relationship of gold mineralization with the batholith, the presence of hornfels and veined and altered auriferous microgranite dikes, and high concentrations of Bi, As and Sb. Galway Metals is well capitalized with approximately US$8.3 million in cash (CAD$10.8), after accounting for the Clarence Stream acquisitions. The Company began trading on January 4, 2013, after the successful spinout to existing shareholders from Galway Resources following the completion of the US$340 million sale of that company. With substantially the same management team and Board of Directors, Galway Metals is keenly intent on creating similar value as it had with Galway Resources. CAUTIONARY STATEMENT: Neither the TSX Venture Exchange nor its Regulation Services Provider (as that term is defined in the policies of the TSX Venture Exchange) accepts responsibility for the adequacy of this news release. No stock exchange, securities commission or other regulatory authority has approved or disapproved the information contained herein. This news release contains forward-looking information which is not comprised of historical facts. Forward-looking information involves risks, uncertainties and other factors that could cause actual events, results, performance, prospects and opportunities to differ materially from those expressed or implied by such forward-looking information. Forward-looking information in this news release includes statements made herein with respect to, among other things, the Company’s objectives, goals or future plans, potential corporate and/or property acquisitions, exploration results, potential mineralization, exploration and mine development plans, timing of the commencement of operations, and estimates of market conditions. Factors that could cause actual results to differ materially from such forward-looking information include, but are not limited to, exploration results being less favourable than anticipated, capital and operating costs varying significantly from estimates, delays in obtaining or failures to obtain required governmental, environmental or other project approvals, political risks, uncertainties relating to the availability and costs of financing needed in the future, changes in equity markets, inflation, changes in exchange rates, fluctuations in commodity prices, delays in the development of projects, risks associated with the defence of legal proceedings and other risks involved in the mineral exploration and development industry, as well as those risks set out in the Company’s public disclosure documents filed on SEDAR. Although the Company believes that management’s assumptions used to develop the forward-looking information in this news release are reasonable, including that, among other things, the Company will be able to identify and execute on opportunities to acquire mineral properties, exploration results will be consistent with management’s expectations, financing will be available to the Company on favourable terms when required, commodity prices and foreign exchange rates will remain relatively stable, and the Company will be successful in the outcome of legal proceedings, undue reliance should not be placed on such information, which only applies as of the date of this news release, and no assurance can be given that such events will occur in the disclosed time frames or at all. The Company disclaims any intention or obligation to update or revise any forward-looking information contained herein, whether as a result of new information, future events or otherwise, except as required by applicable securities laws.